Cisco recently published a paper showing how malicious SSL traffic sometimes uses very specific SSL options. Once you know what set of SSL options to look for, you will then be able to identify individual pieces of malware without having to decrypt the SSL traffic. I wanted to see how well this applies to HTTPS traffic hitting the ISC website. I collected about 100 MB of traffic, which covered client hello requests from about 719 different IP addresses. Use of the SNI field. All reasonably modern browsers use this field. The total size of all extensions. Again simpler than looking at individual extensions. I subtracted the size fo the SNI option to eliminate variability due to different host names we use. I was a bit surprised by the high number of hits without SNI. So I took a closer look at them. Next step: Find out who isn't using SNI. BING: Looks like BING doesn't support SNI yet. This is kind of odd for a major search engine. Some obviously fake user agents. They claim to be a modern browser, but for example only hit one particular URL over and over. Next, let's look at the number of ciphers offered by the client. 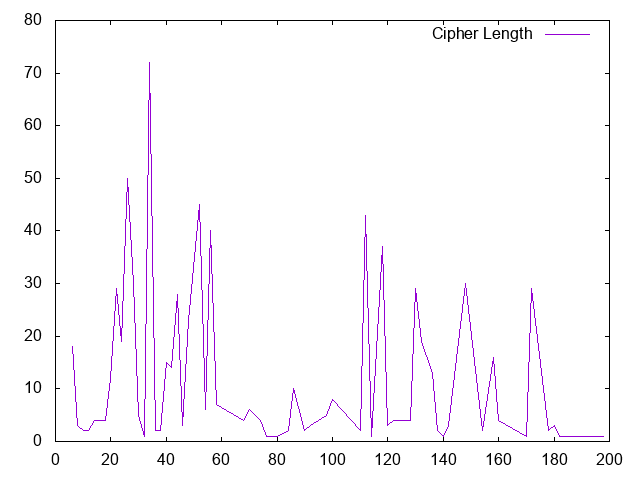 The larges number of ciphers was 99 (cipher length of 198). This request came from 54.213.123.74, which resolves to gw.dlvr.it. Again, we get a fairly wide distribution. 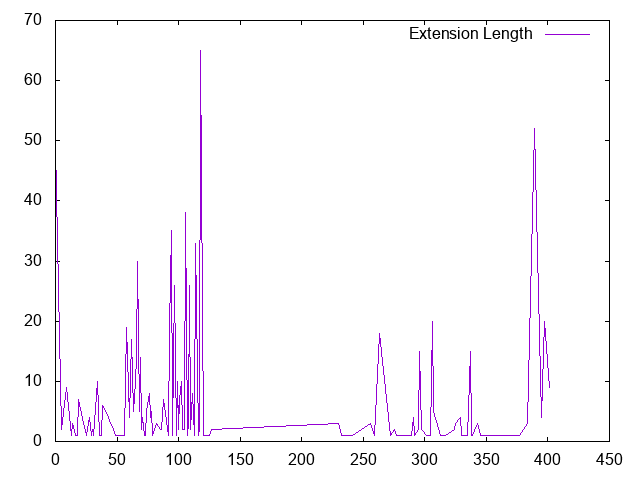 Looks a bit like the cipher length. There some client that didn't appear to use any extensions, which is probably the outlier to look at here first. I think this does deserve more study. I only had a couple hours today to work on this. I think for a workstation networks, watching SSL options will certainly make for a nice "backup" to monitoring user agents, in particular if you can't intercept user agents for SSL. For a server, it comes down to how much you can "tighten up" the range of clients you allow to access your web applications. In a DoS situation, this may be a nice way to filter an attack, and you should certainly look for anomalies. Any suggestions for doing similar analysis with Bro? Could you provide a link to the referenced Cisco paper?